Tirekicking Today: What is Tirekicking Today? Tirekicking Today started life in autumn 1993, as a monthly printed newsletter. Editor Jim Flammang had been writing about cars for nearly twenty years for a variety of consumer publications. Now, he wanted an opportunity to create and produce his own publication. Our printed edition was read by both consumers and auto industry leaders, as well as by auto journalists and public relations people. Each monthly, ad-free issue packed a wealth of information into eight printed pages: feature stories, preview drives, comprehensive reviews, news items, analyses of trends - everything of interest to car shoppers, car owners, and those in the business. Devoid of graphics, the printed edition focused strictly on information. Compact in size, it was the perfect choice for reading anywhere, anytime. Tirekicking Today went online in June 1995, becoming a sub-site of another publication. In mid-1998, we emerged as a separate site. Our site has amounted to a small automotive magazine, with a similar selection of consumer-focused material. New stories appeared regularly, but all of the previous material remained available, archived for handy retrieval. As of September 1999, Tirekicking Today became an Internet-only publication, dropping the printed edition. In 2005, it went on hiatus, due to the press of other editorial duties; but a revival began in February 2006. Recently, Tirekicking Today has been expanding to cover work/labor issues and consumer concerns, in a section titled "Toil & Trouble." Beginning in January 2017, coverage of cars was sharply reduced. It was replaced by coverage of current affairs and politices - especially,. the policies, practices, and ramifications of the Trump administration. During 2009-10, Flammang also served as a member of the Board of Editors and Board of Directors for In These Times, a progressive monthly magazine. All articles and reviews that appear in Tirekicking Today are available for reprinting in other publications, or for broadcast on radio or television. For more information and rates, please e-mail us at JF@tirekick.com. We also welcome appropriate links. 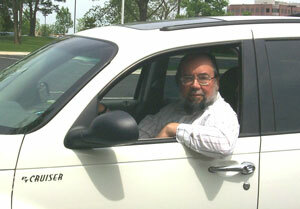 James M. Flammang has been writing about cars professionally since the mid-1970s. Often "on the road" to cover vital industry events and new-product introductions, he deals with nearly every aspect of the auto industry and trade (with the exception of motorsports). Flammang is a past president of the Midwest Automotive Media Association. He is also a member of the International Motor Press Association and the Freelancers Union. He has appeared on radio and TV as an automotive expert, talking about new vehicle models and issues of importance to consumers. From 2001 through 2005, Jim Flammang wrote the vehicle buying guide as well as feature stories for cars.com, one of the most popular automotive sites on the web (affiliated with more than 180 major newspapers). Articles by Flammang also appeared frequently in the Chicago Tribune newspaper. Since 2001, vehicle reviews and feature articles by Flammang have been published and distributed to various publications by autoMedia.com (a now-defunct online syndicate and automotive website). Flammang also contributed regularly to the Auto News Blog at autoMedia.com. Articles have appeared in Ward's Dealer Business magazine. Flammang's vehicle reviews have appeared on the Kelley Blue Book web site (kbb.com) and in the Northwest Herald, a suburban Chicago newspaper. During 2008, he served as a contributing editor for J.D. Power and Associates. Flammang was a long-time contributor to publications issued by Consumer Guide, including writing the used car reports that appeared on their web site and in print. His work has appeared in a variety of magazines and newspapers, including NADA's Auto Exec, Auto Remarketing, and Consumers Digest. He has even contributed to the Chicago Dispatcher, a newspaper aimed at taxi owners and drivers. Until recently, Flammang attended several major U.S. auto shows each year, and has covered the shows in Paris, Tokyo, Toronto, and Bologna (Italy). He also attended a variety of trade conventions and conferences, including Used Car Week, held by Auto Remarketing magazine. An automotive historian as well as a journalist and editor, Flammang has authored some 30 books, including the Chrysler Chronicle; Volkswagen: Beetles, Buses, & Beyond; Chronicle of the American Automobile; Cars of the Fabulous Fifties; Ford Chronicle; Corvette Chronicle; and the Standard Catalog of Imported Cars 1946-1990. He also has written six children's books, including: Cars, a history of the automobile for third-graders; a biography of Robert Fulton for sixth-graders; and a biography of the founders of Google for fifth-graders. Three more children's books were published in August 2008. Flammang is currently working on Steering Toward Oblivion, a critical but humorous history and observation of the car culture and automobile business. Also in the works are several other books with similarly unique perspectives on everyday life. Work Hurts ponders the downside of jobs and careers. Hotel Life dissects the development of consumerism and consumption, with an emphasis on living with less. Flammang also is preparing a collection of essays, titled Absurdities: Logical Lapses in Everyday Life. The first two of his non-auto books have already been published by TK Press, established by Flammang in 2014. Mr. Maurice Knows It All ... And Tells You So delivers to adults the wit and wisdom of a stuffed pig who just happens to know everything. Incompetent explores what it's like to be minimally adept at just about everything. One of Flammang's past books is a detailed history of the Chicago Auto Show. Illustrated with more than a thousand photographs, many never before seen in print, it tells the full story of the longest consecutive-running auto show in America, from the beginning of the twentieth century to the turn of the next century. Click here to see a full list of books written by James M. Flammang.